Right now, here's how the table looks. 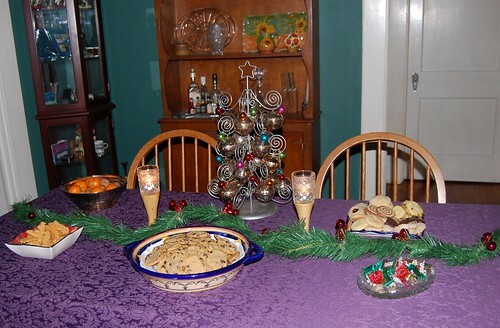 Back: Bowl of Clementines and unshelled nuts, and on the far right, Timmy's cookies. I was very quiet about Timmy's cookies, which have been sitting in a beautiful box on the table. I did tell Tim we'd gotten some, but I never really made a big deal out of them because I wanted them to still be here at Christmas. The thing about those cookies is that I'd eat every one of them if I could get away with it. Each time I sample one of the several varieties he sends, I say, "Oh, yeah, THIS is my favorite. No, this is. No, these are." Etc. They are all so good. The two candles you see on the table aren't candles at all. They're wine glasses that Tom's father made. But since we rarely drink wine, I like to drop a tealight candle in each of them because they sparkle better than Neely O'Hara.